Peyton Manning Speaks About Tom Brady | NFL News, as it happens, when it happens. Your one stop shop. Tom Brady. Peyton Manning. The two have been linked for seemingly their entire careers. Not only are they the two best quarterbacks of their generation, they’re likely the two best of all time (sorry Joe Montana). It’s been a fun debate. How often do you have the two best at their position playing at the same time? 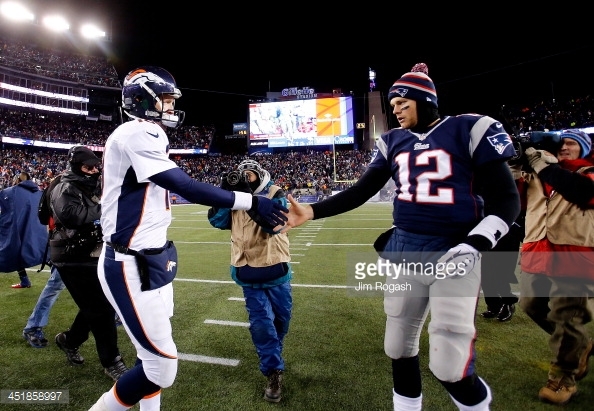 They’re the same age (Manning is 39, Brady 38), and they meet just about every season. The only other time it’s happened in sports is in the NBA, when Larry Bird and Magic Johnson battled it out for an NBA championship every year. The two are nothing but respectful of each other. Both are ultra-competitive, and you can see here that includes individual competition. If someone were to go into Peyton Manning’s private emails, it wouldn’t be at all surprising to find something similar. That’s not the main takeaway from this instance. The main story is that this should never go public. That’s why people settle cases. When the NFL and NFLPA were first negotiating a settlement, Brady said while he wouldn’t accept any suspension, he would consider accepting a fine. Why would Brady accept a fine if he believed he wasn’t guilty? Isn’t accepting a fine an admittance of guilt? This is why. Paying a fine is getting rid of a headache. It’s getting rid of a long court case. It’s protecting your own privacy. Here’s the other takeaway most Patriot haters will never admit and don’t want to hear. This is why you destroy your cell phone. What person that’s paid attention to how Roger Goodell has handled his business in recent years would trust the NFL with their private cell phone? Does it look bad that Brady destroyed it? Yes. Is it really an obstruction of evidence? Not really. Brady and his attorneys provided Ted Wells and the NFL with all of the necessary cell phone records. Can you blame him for not wanting his private cell phone to end up in the NFL’s hands? The NFL, who has manipulated the entire deflategate controversy with leaks at calculated times, in order to shape public opinion. While Tom Brady’s personal opinion of Peyton Manning, the real story is the release of personal information, and helps explain some of the actions taken by Brady in his appeal.